Believing single men made better soldiers than those with wives and families, Emperor Claudius II outlaws marriage for his soldiers. A priest by the name of Valentine defies Claudius, performing marriages in secret for young lovers. For his bravery and his belief in love, Valentine, the priest, is put to death... but the legend of St. Valentine lives on. St. Valentine. Dead since the 3rd century, he's never experienced the love he's made possible for so many young couples. God takes pity on Valentine and sends him to earth, and a woman who needs him, a woman he has to rescue before her grief and despair lead her to ending her own life. No longer a saint, or a legend, he's just a man. Can the man do what the legend could not? My Valentine. A picture only Kate Douglas could paint. "Easily the most emotional, beautiful and unforgettable novella I've read this year, My Valentine is simply breathtaking." "The spirit of love is tangible through the pages. So hold onto your box of tissues, box of choclates and savor this sweet piece of romance with a capital R not only on Valentine Day. " "This is a beautiful love story about two people who really deserved to be loved. I am looking forward to reading more of Kate Douglas' books that are sweet as candy!" One minute he'd been enjoying the sweet song of angels and a bit of celestial cheer, the next he was slogging through a freezing blizzard on the back of a shivering white stallion. Val glanced skyward and shook his head. What he'd really like to do was shake his fist at the Boss, but he figured He wouldn't take that sort of thing lightly. Especially now. Not if what Val suspected had actually happened. He'd wished for love, for the chance to understand and experience the emotion, the passion and the physical, sensual side of love. Val never dreamed it would actually happen. For whatever reason, his Lord had seen fit to release him from his vows. Val accepted the knowledge with a soul-deep certainty that left him feeling strangely empty. To have existed so long with a finite set of rules -- now to have those rules changed without warning or preparation… He sent a silent word of thanks skyward, careful to hide whatever misgivings he felt. Why now? Now, when he was finally getting used to the lifestyle, the perfect weather, the sameness of days, always clear and warm, the sense of "otherworldliness" one felt when no longer attached to a temporal existence. An icy blast hit him. Val shivered and hunched his shoulders against the wind. Couldn't get more temporal than this. Val hadn't been cold since, oh, around the third century. There was that icy dungeon just before Claudius had him put to death. Water running down the walls, cold blasts of wind through a metal grating. Not a particularly pleasant spot to spend his final days, though he didn't actually remember dying. Waking up surrounded by angels… now that was memorable. Angels who were a lot warmer than he was about now. Val glanced skyward and shivered again, almost missing the camaraderie, the fellowship and friendships he'd found over the millennia. Powerful winds blew ice crystals horizontal to the ground. If it weren't so blasted cold, he might appreciate the beauty, the power of a storm like this, but whatever clothing he was wearing, though it was definitely better than a linen tunic, wasn't sufficient to keep him warm. Val glanced down at his legs, covered in rough blue britches. The fabric was stiff, like the cloth used for sails on fishing boats. His coat was more familiar, made of some type of hide with fur around the collar. Wool gloves protected his hands, leather boots covered his feet and lower legs. A woolen scarf wrapped over and around his oddly shaped, wide-brimmed hat. It appeared to serve the double purpose of holding the hat down on his head and the blowing snow out of his collar. Whatever the purpose, it wasn't enough to keep him warm, and from the look of the storm in the fading light of afternoon, he'd better find shelter, and fast. He gave the horse his head, figuring at least one of them would know which way to go. Val certainly didn't have a clue. He had no idea when this was, much less where. At least he had some idea of why, though the details weren't clear. A blast of icy air practically lifted him off the saddle. He clamped his knees down tight and leaned close against the beast's neck. A few moments later, the horse snorted and jerked to a stop. Val raised his head. A small building with a porch across the front stood directly in front of him, barely visible through the swirling snow. White drifts blocked the door, but at least the cabin would offer shelter. Slowly, stiffly, Val crawled off the horse. Grabbing the halter, he led the animal around behind the cabin in search of shelter. He found a small lean-to, pulled the saddle off the large beast and led him into a protected stall out of the wind. From the musty odor, this had obviously been home quite recently to at least a cow or two. Val couldn't find any grain, but he did find a few flakes of hay. It wasn't much, but should keep the horse happy for now. Val broke the ice on the water trough. The stallion snorted, as if just being out of the frigid blast of wind had raised his spirits. 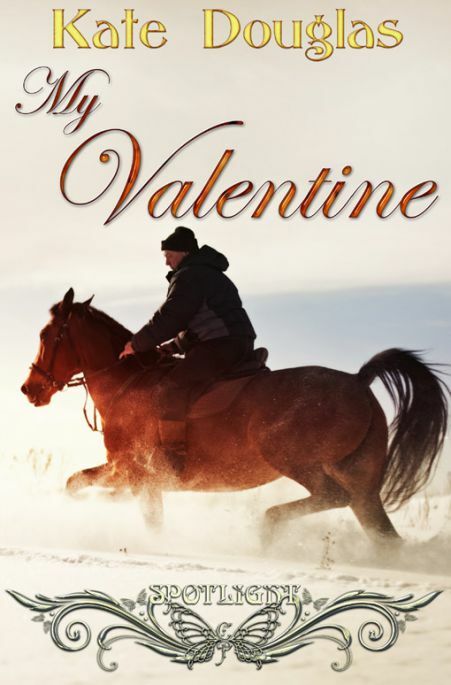 Val spotted a heavy striped blanket neatly folded over a sawhorse, grabbed it, and covered the horse's back. The animal turned his head and whinnied, as if in appreciation. Rubbing his hands together, Val walked once more into the howling blizzard and around to the front porch. The cabin appeared empty, cold and dark without fire or light, but with any luck he might find enough dry wood inside to start a fire. Then and only then would there be a chance to figure out what he'd been sent back for. Freeing a man of his vows, returning him to the mortal plane… neither was an act lightly taken. Pondering the potential challenges facing him, Val headed up the stairs to the front door. He almost fell over the woman's body. Buried in drifted snow, she slumped against the porch railing, as cold and still as an ice sculpture. Her hands were frozen, clasped around a thin shawl that barely covered her shoulders. Her eyes were closed, her dark hair stiff with sleet. Heart suddenly heavy in his chest, Val carefully lifted the woman in his arms and carried her inside the tiny cabin. He couldn't tell if she still lived, saw no sign of pulse or breath, but finally he understood. This fragile being was the reason he'd been yanked back to life.